Title first published in 2003. 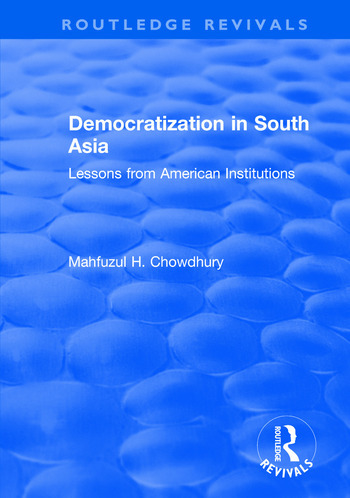 Chowdhury looks at the problems of democratization and development as it relates to building democratic institutions in the newly democratizing countries such as Bangladesh, India and Pakistan. Contents: Introduction; Political developments in South Asian countries; Problems of democratization in South Asia: authoritarian trends, military rule and deviations from democratic development; Electoral politics, institution building and democratization in South Asia; Politics, legislatures and democratization process in South Asia; Building institutions: political parties and democratization in South Asia; Conclusion: evaluation of democratization process in South Asia and lessons from American institutions; Appendices; Bibliography; Index.